Apple has finally joined Instagram – and it's asking iPhone users to join in with the fun. 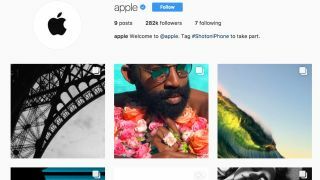 The company's account, which already has almost 300k followers, appears to have been set up solely to capitalise on the popularity of the iPhone as a photographic tool. Flickr stated that throughout 2016, eight of the ten most commonly used cameras on the site were those found in iPhones, with the iPhone 6 topping the list. The other two were the Canon EOS 5D Mark III and its Mark II predecessor. To be in with a chance of having your work featured, the Cupertino-based tech giant asks that people tag their images with #ShotoniPhone. This is the same tag that it has used in much of its advertising for recent iPhone models, given the increasing emphasis on their cameras' capabilities. To help get things started, Apple has already uploaded a number of videos that showcase the work of a number of photographers, setting their shots against music and narration. To be in with a chance of having your images featured, head over to the Apple account. And while you're there, why not follow us too?